The perfect time and the perfect place may never appear in your life. If you are waiting for them, you may never stand on your personal summit. To reach that summit and enjoy your moment in the Sun, you must act. Theodore Roosevelt was born into wealth and privilege. However, the young Teddy had a series childhood illnesses that made his early years difficult and even life-threatening. He learned that if he was to achieve he was going to have to act rather than waiting for the perfect time and situation. I believe this is the genesis of this quote. He knew that life’s challenges would stop you cold, if you allowed them to. 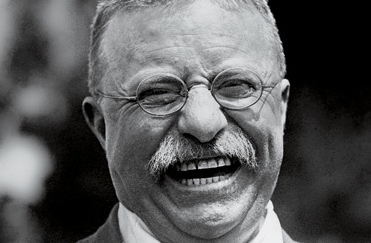 Roosevelt overcame his early health issues through sheer will power. He became a household name after he led his “Rough Riders” in the famous charge up San Juan Hill in the Spanish-American War. Two years later the 42-year-old Roosevelt was elected vice-president under William McKinley. He assumed the presidency when President McKinley was assassinated on September 14, 1901. Roosevelt reached his personal summit. He could have used his sickish youth as an excuse, but instead he thrived by acting. Life is about acting and experiencing not waiting. You may have to act in circumstances that are less than ideal. You may have to push forward through personal challenges. It’s OK! An action taken against the current still gets you further than no action.The time to go is now. Next week, next month or next year are not more favorable, but they will delay your moment on the summit of your dreams. There are some things you have been wanting to do in your life and you have been putting them off. Set the excuses aside and act! Take a few minutes today and make a list of them. Once you have your list decide which one is the most important to you and take some action to start moving in the direction of achieving it. Keep your list and come back to the others. Take President Roosevelt’s advice. Do what you can with what you have and do it today. Perfection? You may encounter it one day, but until then act!